At our Toondah Probus meeting this month’s topic ‘Play It Forward’ was presented by Mac Millar, who at 13 years of age must surely be our youngest guest speaker yet. Mac is also one of most experienced, for over the last three years, as a Rotary speaker, he has raised enough money to be able to present 4,000 soccer balls to underprivileged children in 22 countries around the world. Mac began his talk by showing the audience his specially signed soccer ball – not by soccer stars, but by children from the Refugee Immigration Centre in Brisbane. Mac demonstrated that when you kick a soccer ball to someone they will kick it back: it has its own universal language, The idea for Mac’s project began in Afghanistan with the encouragement of the Australian Army, who presented the balls to the children in local schools. This was followed up by the Salvation Army in the detention centres on Manus and Nauru Islands. All Mac’s projects are carried out under the auspices of Rotary International. Other children to benefit from Mac’s soccer ball programme include Syrian refugees in Jordan, orphanages in North Korea, 50 schools in Gaza, Papua New Guinea (with the help of the Australian Federal Police). Mac has also conducted extensive speaking tours of China and India: in India alone he visited 8 schools a day and spoke each night for 2 weeks. 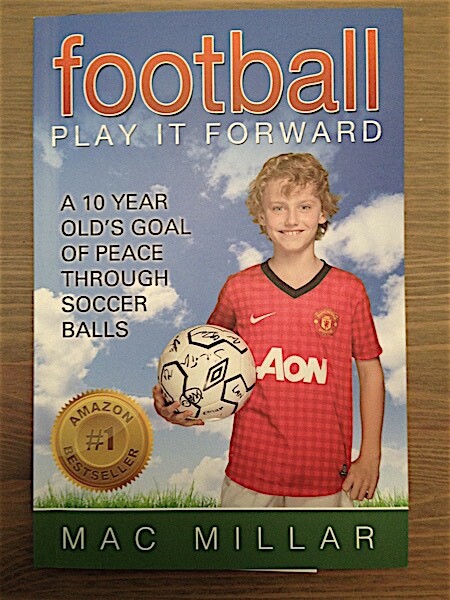 Mac has also written a book, aimed at 10 year olds and upwards, to help fund his passion: soccer. Copies of it are now included in the Disaster and International Family Survival kits.